I am currently attending UH Hilo, am I eligible for this Scholarship? Yes! 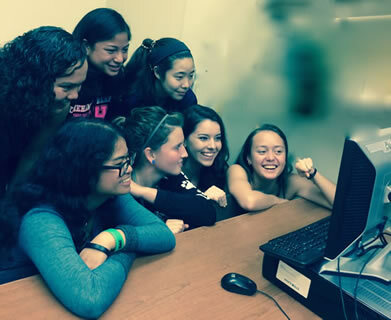 As long as you meet the other eligibility requirements and attend UH Hilo in the Fall semester and beyond, you can apply for the S-STEM Program. I am currently attending UH Hilo, am I still required to turn in my high school transcripts? If you are currently attending college or have taken college courses since graduating high school, please submit your official college transcripts instead of high school transcripts. I am currently a college student, do I still need a letter of recommendation from a high school teacher or club advisor? If you are currently attending college or have taken college courses since graduating high school, please have a college professor or advisor familiar with you, submit a letter of recommendation instead of a high school teacher or advisor. I am currently a college student, do I still need to turn in my SAT or ACT scores? If you are currently attending college or have taken college courses since graduating high school, please submit your official college transcripts instead of SAT or ACT scores. Where do I get my SAT or ACT scores? SAT scores can be sent via the SAT website . Please note that there is a difference in scoring if you have taken the tests before March 2016. I have applied to the University of Hawaiʻi at Hilo, do you still need a copy of my application? What if I submitted electronically? A copy of your application is best, but a confirmation of application or letter of acceptance are also fine. If you are already a student at UH Hilo, your transcripts will stand in for this piece of the application. I am taking math classes over the summer to get me on course for calculus in the Fall. How do I let you know? When listing the math classes you have taken for your application, please add a note at the bottom stating when, where and which classes you will be taking to prepare you for calculus in the Fall. What kind of support do I get from the S-STEM Program if I am accepted? If you are granted the scholarship, you will be required to attend the "Freshman Introduction to Science Seminar,'' which meets once a week and explores the places on campus where students and professors collaborate on research in the lab. You will also be teamed up with a S-STEM Scholar from last year's cohort and you will have Ms. Loving available to answer any questions, talk about any issues or look over essays or applications to programs and scholarships as you need. Plus access to the S-STEM Scholar lounge with computers, internet, and printing capabilities.